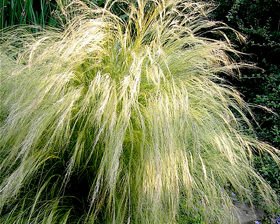 A very attractive grass for the border producing white, soft, wispy pony-tails. Quick to produce dense clumped plants. Flowering May-August on second year. Height: 40cm. Sow February to July in trays, pots, etc of good seed compost in a propagator or warm place to maintain an optimum temperature of 15-18C. Sow in well drained compost, just covering the seed with compost. Germination can be slow.